Well, it appears that very often here, I'm sharing what I am only momentarily working on, or that thing which I relished in only for a bit, but not what really is taking up the most time. So I thought I would share what is taking ALL my time these days. Technical drawings. I know. It's glamorous. And easy to put off here in the studio. There are services that I can hire to do this. But. Well. Part of me really enjoys it once I get going. Of course, I had to stop in the middle of my work this morning because, I really wanted to make a cute little layout of them. I don't know why, I just really started enjoying looking at them. Something about technical drawings of almost anything somehow is really satisfying. Maybe this will be our family Christmas card this year, since its the only thing I've been doing. (Actually that gives me lots of ideas....) Anyway, the above drawings are some excerpts from the Socialite Dress sewing pattern which is one of four that I am introducing here very soon. The goal is to get them off to the printer by year's end, and hope for some late January shipping on them. Thought it would be fun to share each of them one by one. So here's the glamour part. Sweet Juliana smiling right through the savoury band of downtown Nashville characters who were across the street enjoying our photoshoot, and, well, verbalizing such. It was a quick shoot obviously when I finally had to free her from the funny street corner we found ourselves on. But isn't that wall pretty? Think I already blathered bout it here. Anyhoo, the dress. I've made about 4 of them for myself, 2fer Juliana, s'got pockets, easy going fit through the middle (which is working out just fine right now), a pretty structured neckline with yoke and gathers front and back. She throws a huge dark leather belt on her's and wears a cardy over it and it looks so cool. I'll have to show you that. Oh and this is it here too. So that's the real work these past few and upcoming weeks. I'll show another soon! Thanks again for more baby-news congrats, its funny how everyone catches it at a different time, since I've managed to mention and announce several times but never in a very obvious way. So in case you missed it last time too: I'M PREGNANT. And feeling great! Technical drawings have been a big part of my career and I agree, it is something enjoyable. I can get pretty lost just drawing something away. Sometimes it's nice to have that focus. The dress is lovely. I LOVE it! I cant wait until your patterns come out, the dress looks great, especially on your daughter, she is so pretty. Love the dress, too! If I ever get brave enough to sew for myself again, I'd love to make one! Love the dress- looking forward to buying the pattern so I can make one for myself! oooo! I can't wait for the pattern - that dress is adorable! Congrats on the baby-in-waiting! I just learned how to insert side pockets from your technical drawings! So I guess you can say they are quite helpful! That dress pattern is going to look stunning in some grey organic jersey fabric I just picked up. My mind is a whizzing now. :) Congrats on the family expansion! Anna Maria, I adore this dress. I can't wait to get this pattern. What a great dress for all ages. But for my age especially, 27! Thanks for your inpiration. Glad you're feeling so great, you and baby, Anna! So excited for all of you to have another sweet face to love and cuddle. Julianna is just stunning in this picture! She is such a beautiful blend of you and Jeff! I am so glad you are feeling great! Can't wait to see the rest of the patterns! Will the patterns be released soon? I'm so looking forward to the dress and the skirt pattern. They look terrific! Congratulations... you're cooking up two beautiful projects! Wow, I did miss your news! Congrats Anna!! sheesh...it must be nice to have a "teen me" (much like a mini-me only teen aged) to design dresses for. I always thought I'd have kids to do chores, but modeling never crossed my mind. Congratulations on your prenancy! Do you know when you are due? I'm having my first in May and have been paying extra close attention to all my craft bloggers that I read so as not to miss any adorable baby crafts they may be doing. I hope you're having smooth sailing! I went back and looked at past posts, and you did in fact drop hints about pregnancy. I can't believe I never picked up on that until the last post! Can't wait for the new patterns. The dress is lovely and your little model is so beautiful. Hope you are having a wonderful Christmas season. I've been hoping that dress was one your patterns ever since I saw that picture a while back. This yellow one is even prettier (I love the way the fabric pattern fits into the yoke). It's look so comfortable too. There is something kind of behind-the-scene-ish about technical drawings when they are grouped together like that; like seeing back stage at the theatre and discovering all the ropes and pullies. I love that dress! It's absolutely beautiful!! Can't wait to make one for myself! Congrats on your pregnancy as well! How exciting!! This is a real blessing gift for the holidays! All the best for you and your family Anna! Juliana looks smashing - and I can def see how it would be very versatile! Keep up the great work! I love this dress, and will definitely be buying a pattern. I have said it before, but Juliana is absolutely beautiful, such a great model for your work. I think that dress looks great! Now if I can just find a moment when I'm not nursing someone so I could actually wear a dress . . .
Congrats on the pregnancy. I am totally in awe of your ability to be so productive with so many children. I don't know how you do it all. Your talent is amazing. That dress is drool-worthy. And your blog is addictive. Oh, wow, I love the Garden Party one you linked to... better colors for me. I wish I could sew! Ah... you're making me miss my technical designer days! Although I still get to make all of those fun sketches every once in a while, it's my favorite thing to do by far (yes, I'm a nerd), besides pattern-making. I hope it gets more fun for you though- especially when you're almost done! :) Congrats with the babe too! I've thought so - your hints have been caught. Congratulations! I love to hear that there are women who feel good when pregnant. Hooray for you and your family! love this dress! i'm so looking forward to this pattern! and...congrats on the baby news! i'm addicted to your blog and find this news so exciting! I love the drawings. Can you share how you go about designing them? What programs your using and any books/instructors/classes that help with that? OH how I LOVE that DRESS! I MUST have one! (Now I'll need that fabric too! squeal! And my b'day's in January - I know what I'm getting fer meself!) Love those stockings too! Oh, I hope so. I ordered enough of this particular fabric to make this dress, but I have no idea how to begin to figure it out. Also, your sweet Juliana looks like a miniature Anna Maria. Ever call her "mini me"? if i didn't like you so much, i'd have to hate you. you are about one month further along than me and i feel like fresh hell! i am counting the days until this trimester is over. this is our first kid and we're really excited but for serious, while i seem to be past the spontaneous vomit portion of my early pregz days, the nausea is incredible. gah! off to get bloodwork. thanks for being so lovely. i mean it!! xoxo. I would love to learn how to do technical drawings. Wish I could find a class around here for that. Thanks for sharing that with us. I love the style of that dress, and the pockets are a fabulous touch. Great photo shot of this one too! Congrats on the new addition! LOVE this dress!!! Have to ask, are you considering making the pattern in larger sizes? Most cute patterns only go up to 18 (which usually translates to a RTW 14) and I can tell you there's a good market for cute 'plus' sized patterns (esp since very few exist!). Please, please, please!!! Gorgeous dress! Can't wait for the pattern. soooooo excited you are doing patterns - yay!!!! That is so gorgeous! I love it in the other print, too. Glad you are feeling well. As a sewer I just want to say how much I enjoy the technical drawings. Over the years I find that I follow the drawings more than the words, although both are important, and so i love lots of illustrations in patterns. Thanks for taking the time! Well, Juliana is just beautiful. And apparently quite the trooper. It's been quite cold here lately. So that was very sweet of her to pose for you in a sleeveless dress! Too bad I wasn't downtown that day. And, by the way, I'm so glad that you're feeling so well. You're lucky! Anna- its UNBELIEVABLE how much Juliana looks like you...two beauties! I love this dress pattern and how forgiving it is in the mid section. Looking forward to the pattern! Oh this roocks! I've been looking for some cool, hip (and hopefully easy) patterns like this. Can't wait Anna! Juliana is looking prettier then ever! SUCH a cute dress! i'll definitely have to get that pattern! and congrats on the new little one! Oh Anna Maria, I can't wait till those patterns come out. I can't wait to purchase them! Congratulations again on the coming baby! I just found out that I will be expecting my 4th :) Thank you also for the donation. congratulations...I'm looking forward to your book arriving soon in my post box down here in australia! I read this post quickly yesterday and then went about my business- but then found myself coming back over and over to look at the picture and think about how excited I'll be to get a hold of these patterns when they come out! Stunning, just like her mother. Congrats on the patterns and on the new addition. I only picked up on it on the last post myself! All the best. ooo! i can't wait for this pattern to be published! you never cease to amaze me! Congratulations Anna Maria! Baby # 6 or 7?? You still look amazing-- can I borrow your genes? I didn't think Juliana could get any more beautiful but she is!! No wonder she drew a crowd! 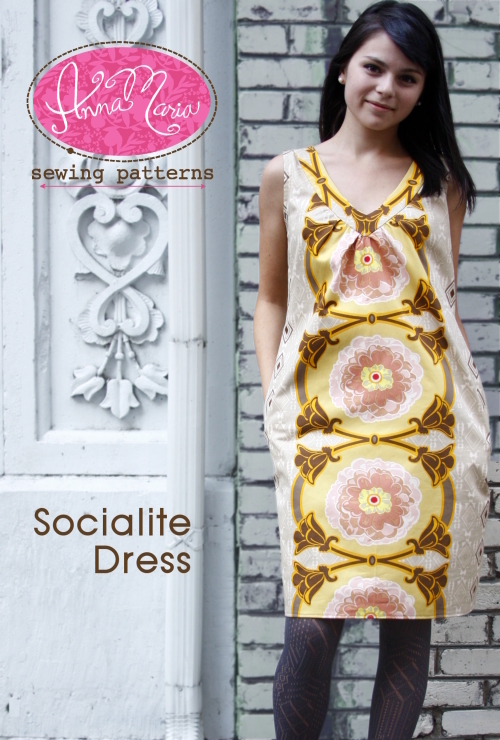 I LOVE this pattern, especially with your fabrics! Her tights are adorable too. I hope my daughter grows up to be like her. She already expresses an independence in her dressing. 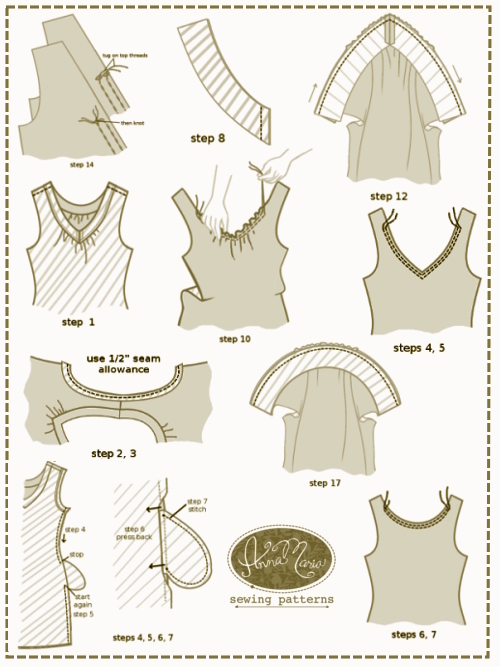 I also think the whole technical sewing drawings would be really cool to use in some way for your Christmas cards! It's so you!! Oh, I love this dress! And with those lovely technical drawings, I might actually be able to make it! OH my gotta make me one of those there dresses, that is so my style!!! I love this pattern! I can't wait to make one for myself. I love this dress. Can't wait for the pattern to come out as I will definitely be on that bandwagon. I love the downtown photo shoot story - I shot a friend's wedding portraits on a shady street in downtown Raleigh and had much the same experience. Congratulations to you and your family (and to your dog for being so sweet). Please, please , please say that this amazing pattern is going to come in plus size!!!! It's spectacular. P.S. your DD is gorgeous! have a happy travel in Taiwan- http://www.siwei-ocean.com 台灣美麗澎湖民宿西衛海推薦 合法徵信公司評鑑 澎湖民宿推薦,住在菊島最舒適的民宿裡.徵信社擁有強大的調查資源,徵信探員幫助你釐清工商真象.